Qi Store - Buy Classes! In Chinese, zhi means wisdom and intelligence, the initiating synthesis of the functions performed by the physical mind in dealing with external things. The Chinese meaning of neng roughly translates to ability and capability, in all of their aspects. Zhineng Qigong is a complete integrated system developed to liberate human energy in all dimensions, ultimately opening one's heart to the awakening of objective conscience. It also provides an effective path to take charge of one's physical health and empower healthy living. Zhineng Qigong finds its roots in the 7000 year old tradition of folk, shamanic, buddhist, taoist and confucianist traditions - integrating them into a whole with the latest understanding of physiology, psychology and medicine. Through posture, movement, breath and mental focus, Zhineng Qigong offers a methodology to rediscover the inner medicine - qi, the vital and healing resource within us - and to magnify the exchange between ourselves and nature, enabling us to become harmoniously connected with the infinite creative power of the universe that ultimately is the origin of love, compassion, and the source of all healing. Qigong is the oldest form of Chinese medicine and indeed the basis upon which Chinese medicine first developed. It entails learning to guide qi (amongst other things, the vital energy which differentiates life from death) through a series of movements and postures and focused mind activities. The long history of qigong has led to a wide variety of forms, some more mental, others more physical; the various forms of medical qigong, under which Zhineng Qigong is generally classified, focus equally on the body and mind. Zhineng Qigong was developed in the early 1980s by Professor Ming Pang at a time when the Chinese government encouraged the popularization of qigong in an effort to reduce medical costs and maintain good health among the Chinese population. Its exercises are relatively easy to learn and very effective and his methods spread rapidly throughout China. Today it is the world's most widely practised qigong, with upwards of 20 million practitioners globally. Practitioners learn and practice a series of movements that make up a particular 'method' or exercise. The daily practice of these movements increases vital energy and unblocks the energy channels of the body to bring about a free flow of qi. Improved health is the outcome, since all illness is associated with lack of qi and blockages in its flow. Zhineng Qigong uses both body and mind to enhance health and heal illness. A series of movements and postures are carried out in a state of deep relaxation. Each series is part of a systematic method of practice that an individual can choose to follow more or less intensively, to cure illness or simply to remain in optimal health. 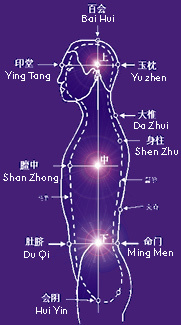 Numerous studies in China and internationally have demonstrated that the practise of qigong improves lung capacity, improves the transportation of oxygen to the cells and their utilisation of it, improves the functioning of the circulatory system, makes cardiac muscles more efficient, increases digestive juices, adjusts internal secretions and regulates the glands, increases bone density, slows aging and increases longevity. While the first and most obvious benefits of Zhineng Qigong are an improvement in physical health and a sense of wellbeing, its practice also has powerful effects on the mental faculties. Many of its practitioners not only are cured of their illnesses and attain a much better level of physical health but also develop their mental faculties and can use them to benefit both themselves and others. Zhineng Qigong is a form of moving meditation that lays equal emphasis on the body and the mind and that involves both dynamic and static gong, i.e. both movement series and standing postures. It consists of an integrated series of methods and exercises that together work on the whole body and organs as well as the Mind (shen). Professor Pang was able to integrate these select aspects from ancient Chinese civilizations, as well as from the explorations of modern science, medicine and philosophy. He also adopted the philosophical essence of the Concept of Entirety---The Oneness of Man and Nature. The Qi-Field Technique (zuchang) is a unique, broad-scale and highly effective teaching method-that Professor Pang created to augment an intelligent energy field for the purpose of teaching and treating small and large groups of people. "We cultivate our own life energy through accessing nature's great store of life energy (qi). This approach produces quick results. But cultivating one's qi is not the most fundamental; cultivating one's spirit is. Mastery of qi is really achieved through mastery of consciousness. We use consciousness in a careful, craftsman-like way, to shape our life, to attain our goals. If we use modern terminology to name this process, we call it qigong..." "…in modern terms, qigong is just the refinement of consciousness to enhance the state of energy in the body. This leads to vibrant health, a harmonious body and mind, and an awakened spiritual life.